Charles Hesterman Merz (1874-1940) of Merz and McLellan was a British electrical engineer who pioneered the use of high-voltage three-phase AC power distribution in the United Kingdom, building a system in the North East of England in the early 20th century that became the model for the country's National Grid. 1874 October 5th. Born in Gateshead the eldest son of John Theodore Merz (from a German Quaker family) and Alice Mary Richardson, the sister of John Wigham Richardson the Tyneside ship builder. He then went to the Bankside Power Station of the City of London Electric Lighting Co, as assistant to Aubrey Llewellyn Coventry Fell, superintending contracts for the British Thomson-Houston Company (BTH), manufacturers of electrical plant, of which company his father was at that time a director. 1902 With the arrival of William McLellan, the firm became Merz & McLellan. Merz and McLellan had first worked together in Cork. His next major project was the Neptune Bank Power Station in Wallsend near Newcastle. It was the first three-phase electricity supply system in Great Britain, and was opened by Lord Kelvin on 18 June 1901. In the same year he toured the USA and Canada. He was known affectionately within the electricity industry as the "Grid King". He was a consultant to a local tramway company on the electrification of their horse-drawn routes and, subsequently, to the Tyneside local lines of the North Eastern Railway, a pioneer of British mainline railway electrification, whose electric systems were turned on in 1904. As well passenger commuter lines, these included a 0.75 mile freight line using the ES1 electric locomotive. 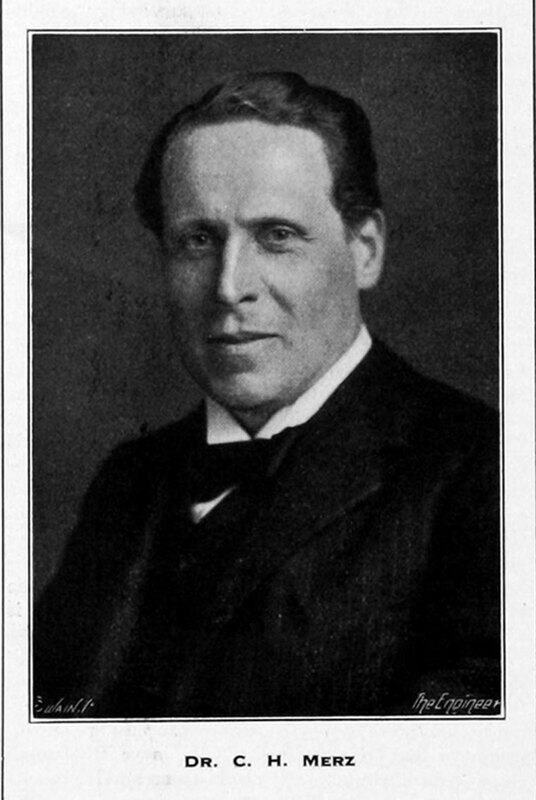 1905 He first attempted to influence Parliament to unify the variety of voltages and frequencies in the country's electricity supply industry, but it was not until World War I that Parliament began to take this idea seriously, then appointing him head of a Parliamentary Committee to address the problem. 1913 June 18th. Married Stella Alice Pauline Byrne de Satur (b. 1883/4), daughter of Edmond Charles R. Byrne de Satur, artist, of Dublin; they had a son and a daughter. Merz's own system ran at 40 hertz, 20,000 volts, but he was forced to convert it to 50 hertz to match the rest of the British system. 1940 Merz designed the electric drive equipment for the TOG 1 tank. 1940 Merz, his two children, and two servants, were killed by an enemy bomb at his home, 14 Melbury Road, Kensington, London, on the night of 14–15 October 1940. The house was completely demolished, only Mrs Merz escaping, though injured. In the field of electricity supply Merz ranks as the premier electrical engineer in the first half of the twentieth century. Charles Hesterman Merz, consulting engineer and senior partner in the firm of Mere and McLellan, died on October 15, 1940, as a result of enemy action. Mere was born at Gateshead in 1874, and educated at Bootham, York, and at Armstrong College. His first important work was as engineer for a scheme to supply electric power to works and shipyards on Tyneside - the first undertaking in England started primarily for electric power supply. About 1900 Mere went into partnership with Colonel McLellan and founded the firm of Mere and McLellan. In 1903 he acted as engineer to the North Eastern Railway for the electrification of the Tyneside lines. He devoted particular attention not only to electric traction, but to power supply problems and to fuel economy. Later he devised electrification schemes which have been carried out in India, South Africa, Australia, the United States, and South America; and he was largely responsible for the present power supply system of Greater London, and for the construction of the grid. Early in the way of 1914-1918 Mere became a member of one of the committees set up by the Admiralty to deal with invention and research. Later, when the submarine menace became acute, he organized and became Director of the Admiralty Department of Experiment and Research. Many developments of this department have proved of considerable use during the present War. His scientific gifts and knowledge were placed freely at the disposal of the country, and during his career he held many important appointments. He was Vice-President of the Institution of Electrical Engineers from 1912 to 1915, a member of the Institute of Civil Engineers, and a Fellow of the American Institute of Electrical Engineers. In 1931 he was Faraday Medallist and in 1932 was made honorary D.Sc.(Durham). He was the author of many papers on electric power supply and was responsible for many technical improvements. Dr. Merz was a joint member of the Institute of Metals and the Iron and Steel Institute, and was elected in 1917. "...with very great regret that we have to record the death through enemy action of Dr. Charles H. Merz. With him also perished his two children, Pauline Barbara Merz and Robert de Satur Merz, and two of the family's servants. Dr. Merz was born at Gateshead in 1874, and throughout his career was intimately connected with the development of electric power supply and electric traction. He had also been concerned with the legislative steps necessary for their economic development..."
↑ The Engineer 1940/10/25, p267.